On its own, falconry is not generally considered an especially dangerous sport for its participants. But in the Middle Ages, it was often conducted on horseback, a practice that entails its own hazards – and on at least one occasion, this combination proved deadly enough to alter the course of history. 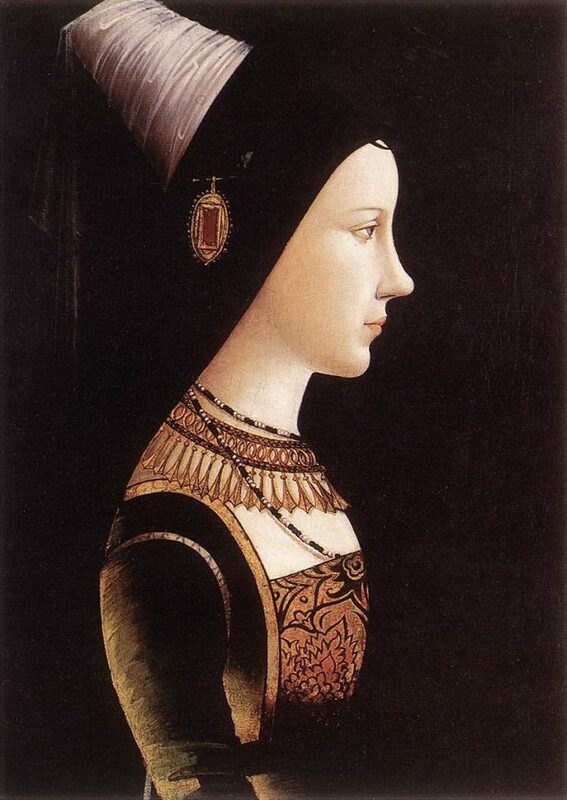 Early in 1482, Mary of Burgundy, sovereign regnant of the Duchy of Burgundy and consort of Archduke Maximilian I of Austria, embarked on a falconry hunt with her husband and several knights. Falconry was considered a genteel pastime for royalty and nobility of the Middle Ages, for both men and women alike, and there was nothing unusual about Mary’s participation in this outing. In fact, by all accounts, Mary adored sport and was an avid equestrienne, hunter, and falconer. A portrait of Mary (ca. 1490) attributed to Tyrolian painter Michael Pacher. The falcon hunt took place in the quiet, picturesque Flemish countryside south of Bruges, on the property of Adolph of Cleves, Lord of Ravenstein. During the hunt, Mary’s horse lost its footing, throwing her from the saddle into a ditch. The horse landed on the young duchess, breaking her back but not killing her outright. Mary suffered for several weeks in what must have been an agonizing, bedridden death, finally succumbing to internal injuries at Wijnendale Castle, on March 27. 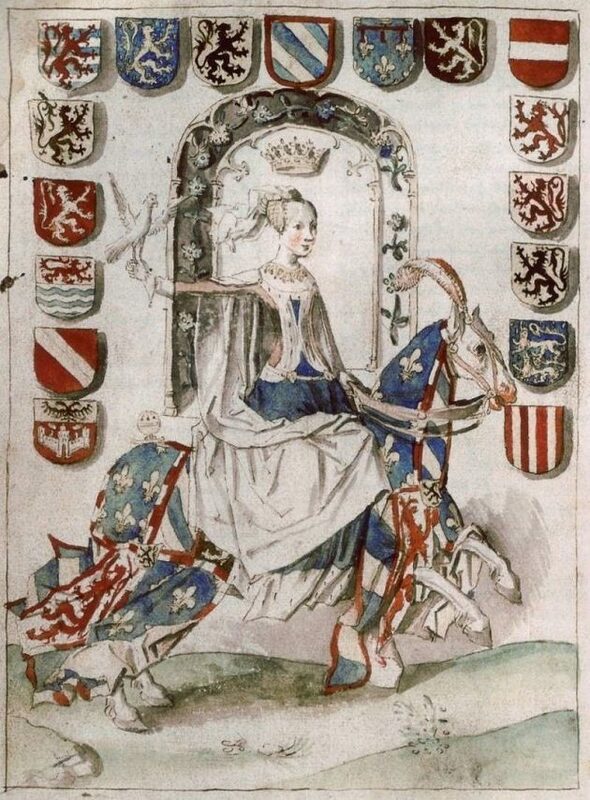 Mary of Burgundy on horseback with a hawk or falcon, from the Excellente cronike van Vlaenderen, a 15th-century Flemish chronicle. 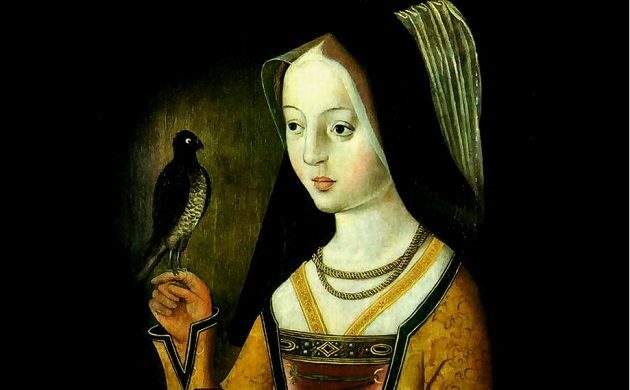 Mary’s peculiar and unlucky death by falconry at the age of 25 was only the latest in a series of blows dealt to the fortunes of the House of Valois-Burgundy and its duchy – and one that would set into motion a dynastic rivalry that would plague Europe for centuries. Her father Charles the Bold had been killed only five years earlier at the Battle of Nancy in 1477. Mary, as the duke’s only child, was named heir and worked quickly to arrange a marriage aligning her imperiled realm with the powerful House of Habsburg in August of that year, a union that denied Burgundian inheritance to the infuriated Valois monarchy of France and ensured centuries of enmity between France and the Habsburgs. The ensuing War of Burgundian Succession culminated in a final partition of Valois-Burgundy holdings between the French crown of Louis XI and the Habsburg domains of Mary’s widower, Maximilian. But while the dream of an independent Burgundy died with her father and the title of the Duke of Burgundy was eventually confiscated by the King of France, while she lived, Mary persisted in her claim to the title of Duchesse de Bourgogne. 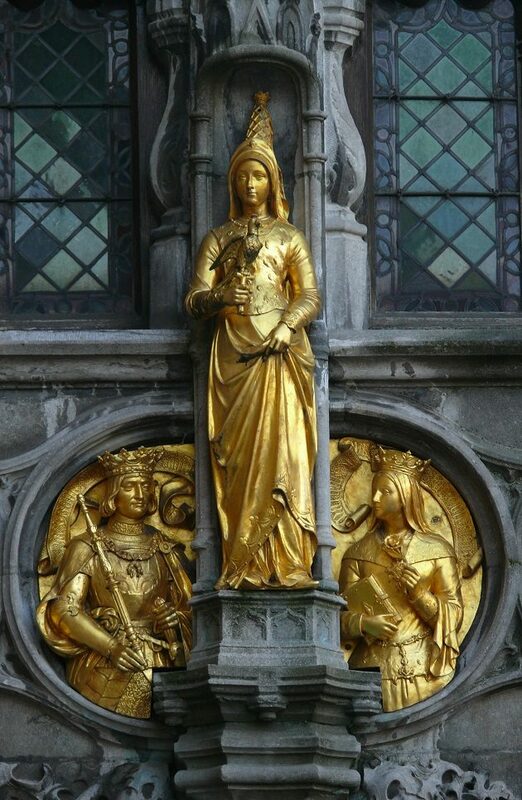 A gilded statue of Mary of Burgundy holding a hooded falcon, flanked by her father Charles the Bold and step-mother Margaret of York, on the entrance façade of the Basilica of the Holy Blood in Bruges. But as tragic as Mary’s death was, after over half a millennium, enough time has elapsed for it not to appear indecorous for we, as curious birders, to wonder about the fate of that other participant in that fateful hunt: Mary’s feathered companion. Did the duchess’s hawk escape unscathed? Was it hooded and therefore mercifully blind to the fatal mishap that befell its owner? Did it, perhaps, fly off unnoticed in the confusion of that awful moment, lost to the wild for good as panicked pages struggled to administer aid to the poor, injured woman lying beneath her horse? Or was it a loyal bird that remained with its mistress to the end? And, most importantly, what kind of bird did Mary carry into the field that fateful day anyway? Not surprisingly, contemporary chroniclers are frustratingly silent concerning these particulars, and most of these questions will probably remain forever unanswered – perhaps except the last. It’s very likely that Mary’s companion on her final hunt was a Eurasian Sparrowhawk (Accipiter nusus), the preferred falconry bird for women in the Middle Ages. 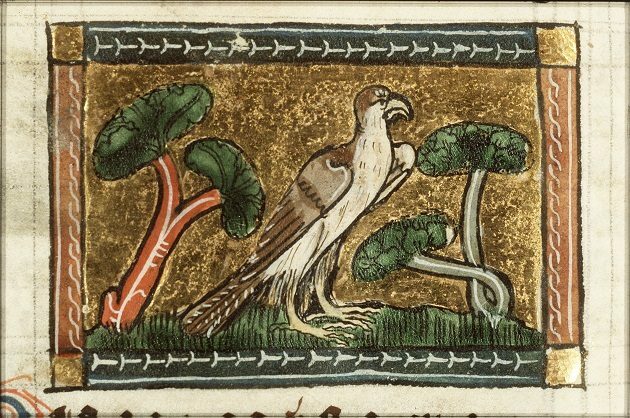 Medieval treatises Europe paint the agile sparrowhawk as a fussy and flighty bird, given over to unpredictable fits. It was considered a demanding bird for even the most experienced handlers, difficult to tame, and with a reputation for perpetual nervousness. Yet because of its small size, the sparrowhawk was considered an appropriate bird for noble and royal women of the age, easily “carried by ladies in aristocratic, country-picnic hunts”, according to historian John Cummins, author of The Art of Medieval Hunting: The Hound and the Hawk. Not only did sparrowhawks make troublesome falconry birds, but they were inexplicably frail in captivity, “prone to go rigid, fall off the perch and even die out of what seemed to their master to be the ultimate manifestation of their innate perversity”, according to Cummins. The temperamental Eurasian Sparrowhawk as depicted (and identified by its current specific epithet of Nisus) in Der naturen bloeme , a 14th-century Dutch bestiary by Jacob van Maerlant. Birders know that in hawk and falcon species, the female is typically larger than the male. This is particularly true with the Eurasian Sparrowhawk, with the female outsizing the male by up to twenty-five percent. The male Sparrowhawk – called a “musket” by falconers – was too small to be of much use in hunting, but the female was capable of taking partridges, woodcocks, and small pheasants, as well as songbirds like blackbirds, thrushes, and larks that made up a now mostly-vanished part of the European diet. Mary’s own death has been the subject of several works of art over the centuries, both shortly after the event and as a romanticized episode in the works of latter-day artists. 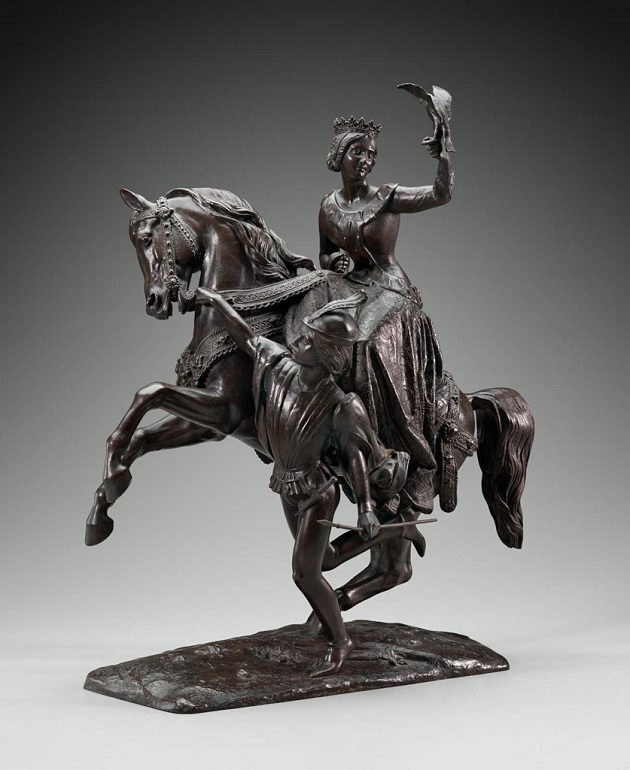 A stunning equestrian statuette by the 19th-century French sculptor Jean-Auguste Barre movingly captures Mary in the moment before her ill-fated fall, steadying a hawk in her hand before being unseated by her rearing mount. Mary of Burgundy (ca. 1837 – 1842) by Jean-August Barre (1811 – 1896). Much more grim is her possible depiction in The Hours of Joanna I of Castile, a 16th-century book of hours probably produced in Ghent with manuscript illuminations by Gerard Horenbout, one of the most renowned Netherlandish miniaturists of the age. A miniature illustrating the Officium defunctorum (Office of the Dead) in the Joanna hours depicts a lady falconer on horseback pursued – along with the rest of her hunting party – by three cadaverous huntsmen brandishing spears or large arrows. 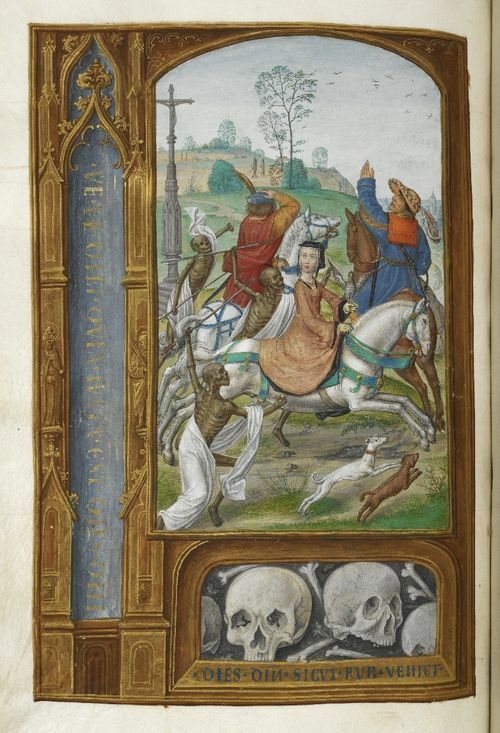 The image is a remarkable depiction of the common late-medieval trope of the Three Living and the Three Dead, which depicted encounters between parties of usually proud, vain, but very much living people with their deceased but animated predecessors in death, who remind the living to change their ways before it’s too late. The jarring motif was meant to serve as a memento mori (“remember that you will die”), a popular medieval contemplation on the transience of life and death’s certainty. However, in most versions, the meeting consists of a mildly ominous conversation, without the dramatically implied violence of the miniature in The Hours of Joanna I of Castile. The hunters hunted: a detail from from The Hours of Joanna I of Castile depicting an encounter between the Three Living and the Three Dead. Could the woman on horseback with a falconry bird be Mary of Burgundy? It isn’t certain that the Joanna miniature is depiction of Mary in the moment of her fatal injury, but the initials “MM” appear on the rider’s harness, and the book is named and was possibly created for the wife of Mary’s son Phillip the Handsome, who was only three years old at the time of his mother’s accident (incidentally, Joanna I is better known to history as Joanna the Mad, who seems to have suffered from some form of mental illness). A decidedly less morbid portrait of Mary now hangs in the museum at Gaasbeek Castle in Lennik, in Flemish Brabant, just west of the duchess’s birthplace of Brussels. Executed sometime in the decades immediately following Mary’s death, the painting shows the duchess holding a small, dark hawk which seems to be a Eurasian Sparrowhawk. 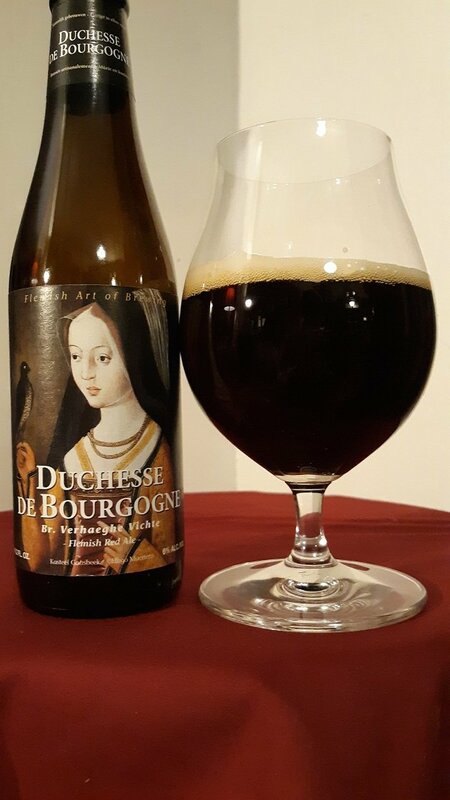 This is also the painting that adorns bottles of a lovely sour ale in the red Flemish style by Brouwerij Verhaeghe, a beer named – naturellement – Duchesse de Bourgogne in honor of Mary. The Verhaeghe brewery was established in 1875 and is located in Vichte in West Flanders, only about twenty miles south of the Kasteel van Wijnendale where Mary died – at least as the sparrowhawk flies. 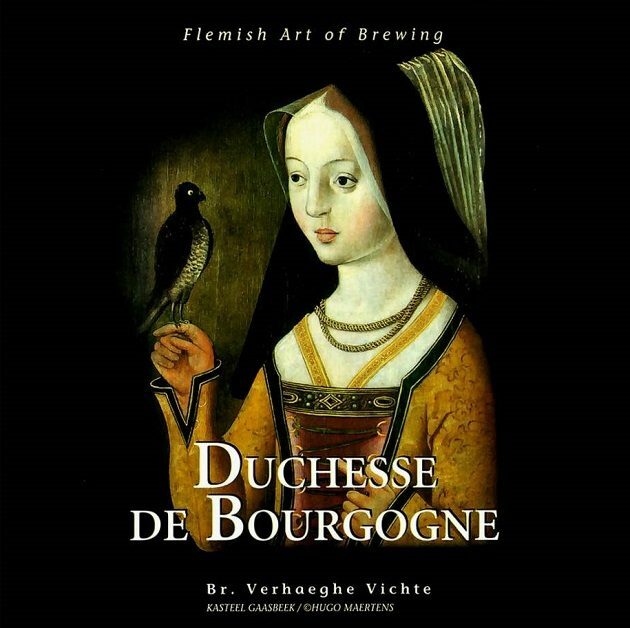 Brouwerij Verhaeghe bottles Duchesse de Bourgogne from a blend of young and old sour ales, one at eight months and an older, more complex eighteen-month vintage matured in oak barrels. The resulting beer emerges a deep burgundy (fittingly enough), crowned with a foamy, tawny head that perseveres surprisingly well for a sour ale. Duchesse de Bourgogne offers a sweet-and-sour bouquet of cherry cordial, plum, and rosewater, with tart balsamic overtones. Blackcurrant and rich caramel are well-matched partners in the vinous palate, complemented by lively notes of blood orange, pomegranate, and candied apple. For all its fruity sourness, Duchesse de Bourgogne, offers a delicate, velvety mouthfeel, ending with a dry, gently prickly finish. If you find a bottle of Duchesse de Bourgogne, raise a glass and spare a thought for poor Mary of Burgundy and the unknown fate of her sparrowhawk.